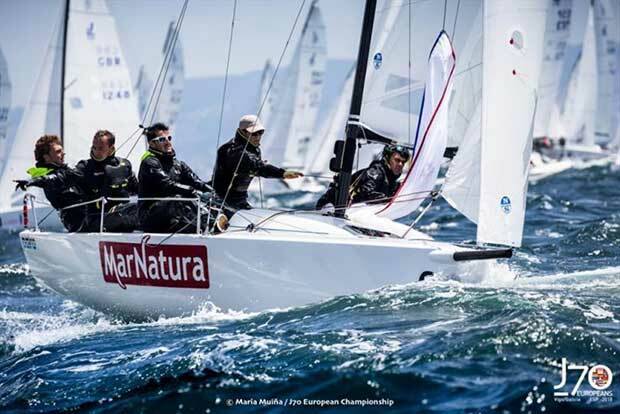 Day Two of the 2018 J/70 European Championships produced a second day of thrilling racing in the Ria de Vigo. The wind speed topped out at over 20 knots for much of the day, providing awesome downwind conditions for the 69 international teams competing for the J/70 Open and Corinthian European titles. Three races were held, with a discard kicking in on the last race of the day. Alberto Rossi’s “Enfant Terrible” (ITA) put in another great performance winning race four to keep the pressure on the leader, just two points behind. Paolo Tomsic’s Società Nautica Grignano (ITA), had another great day scoring a 5-10-2, putting the Corinthian team from Lake Garda into third place overall and top of the Corinthian Division. Umberto de Luca’s “Enjoy” (ITA) is in fourth place after six races. The 26 year-old from Yachting Club Torri on Lake Garda, started sailing in the class last year after competing in the Laser and Finn Classes. “There was strong wind today and very choppy seas with some good waves so it was a lot of fun, especially downwind. The results are coming because we are getting everything together but the most important thing is that we are very fast, especially upwind, which has got us out of some tricky situations, and the tactician is making some really good calls. It is an honour to sail against these big guys in the sailing world, and exciting for us to do so well.” Umberto de Luca. J/70 “Calypso” (MLT) co-skippered by Johnathan Calascione and Seb Ripard, started the day well with a second place but lost a batten in the pre-start for race five forcing the team to retire. Calypso was back out for race six, scoring a tenth place, keeping the Maltese team in the top five. Luis Bugallo’s “Marnatura” (ESP) had a great day, fully pulling the trigger downwind, scoring three top-ten results to finish the day in sixth place overall, and second place in the Corinthian Class. “Yesterday we decided to be conservatives and not take too much risks. However, today we planned the opposite and it worked. We are happy with our day.” Luis Bugallo’s Marnatura from Real Club Náutico de Vigo is the top performing Spanish boat after six races. 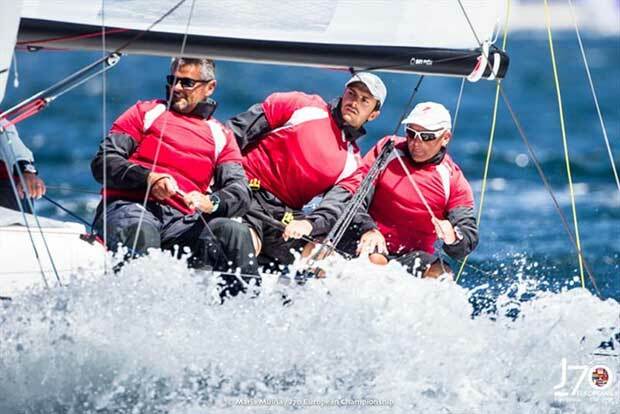 After racing, competitors enjoyed the facilities of the purpose built Regatta Village at the Real Club de Vigo with live music from Vigo’s Diego Pacheco and Tonechi. An official dinner was held at the Noble Hall at the Real Club Náutico de Vigo, honoured guests included representatives of each country present at the J/70 European Championships. Three races are scheduled, tomorrow Thursday 14 June.